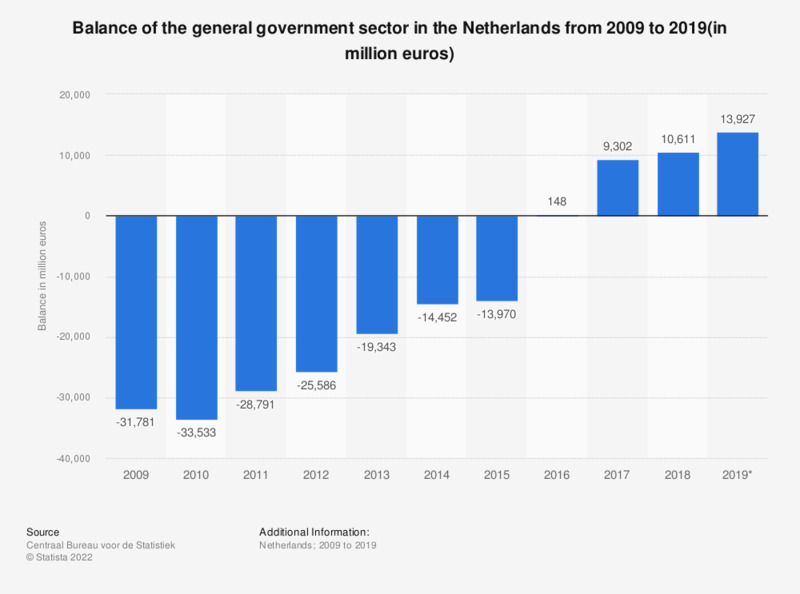 This statistic displays the balance of the general government sector in the Netherlands from 2007 to 2017. This shows that in 2016, the balance of the general government sector was at approximately 2.9 billion euros, meaning that for the first time since 2008 the government had a surplus on the budget. By 2017, the surplus had increased to over eight billion euros. The source defines the balance of the general government as follows: "The balance between revenue and expenditure of the general government sector. In the national accounts this equals net lending/net borrowing of the general government sector. The balance of the general government sector is often presented as percentage of GDP. The balance of the general government sector (or EMU-balance) is an element of the Stability and Growth Pact. A positive figure indicates a surplus, a negative figure indicates a deficit." * The figures for 2016 and 2017 are provisional.